I fell back in love with banana bread over a lazy Sunday morning brunch with my two boys. 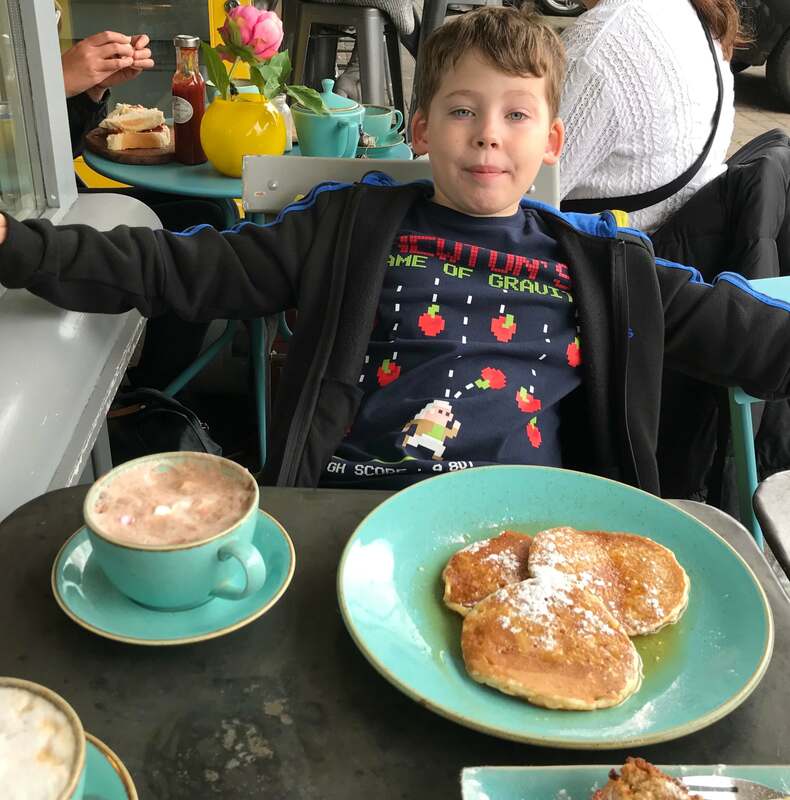 We decided to give Mum some peace and headed into one of our favourite local cafes ‘The Brentwood Kitchen’. The boys love the pancakes there . I fancied something different for a change and decided on a warm banana bread with Nutella . It was delicious. That spurred me on to develop my own recipe. 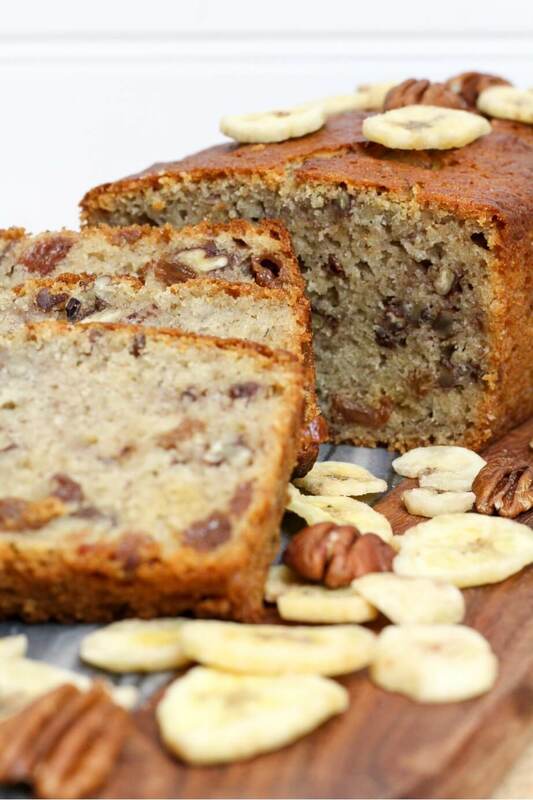 The one thing that slowed me down with receipe development is that my family love bananas and they never last long enough in the house to get nice, ripe, brown and spotty which is what you want for this recipe. I ended up having to hide them! A warm slice of banana bread slathered in Nutella is delicious but I also like to drizzle over some caramel sauce as a lovely alternative. It goes brilliantly with the pecans in this recipe. 1 Preheat the oven to 180c/160c Fan. 2 Mash up the bananas to a paste consistency. 3 Combine the flour, bicarbonate of soda, pecans, choc chips and salt into a large mixing bowl. 4 In a stand mixer or another bowl, cream the butter and sugar together until light and pale. 5 Add the eggs, bananas, buttermilk and vanilla extract to the butter and sugar mixture and mix until well combined. 6 Fold in the flour mixture gently until just combined. 7 Grease a 2lb loaf tin and pour the cake mixture into it. 8 Bake for about an hour until golden-brown and if you insert a skewer it comes out clean. 9 Remove from the oven and allow to cool in the tin for a few minutes. 10 Turn out onto a wire rack and allow to cool. Serve warm or cold with a drizzle of caramel sauce or spread with Nutella . Mash up the bananas to a paste consistency. Combine the flour, bicarbonate of soda, pecans, choc chips and salt into a large mixing bowl. In a stand mixer or another bowl, cream the butter and sugar together until light and pale. Add the eggs, bananas, buttermilk and vanilla extract to the butter and sugar mixture and mix until well combined. Fold in the flour mixture gently until just combined. Grease a 2lb loaf tin and pour the cake mixture into it. Bake for about an hour until golden-brown and if you insert a skewer it comes out clean. Remove from the oven and allow to cool in the tin for a few minutes. Turn out onto a wire rack and allow to cool. Serve warm or cold with a drizzle of caramel sauce or spread with Nutella . Those who know me well know that bread making has been my nemesis. However over the past year I have given it a lot more focus and one of the guys I used to work with is a bit of a legend in bread making and with his sage advice “wetter is better”, my bread making has turned a corner. The extreme end of the “wetter is better” mantra is the Brioche dough. 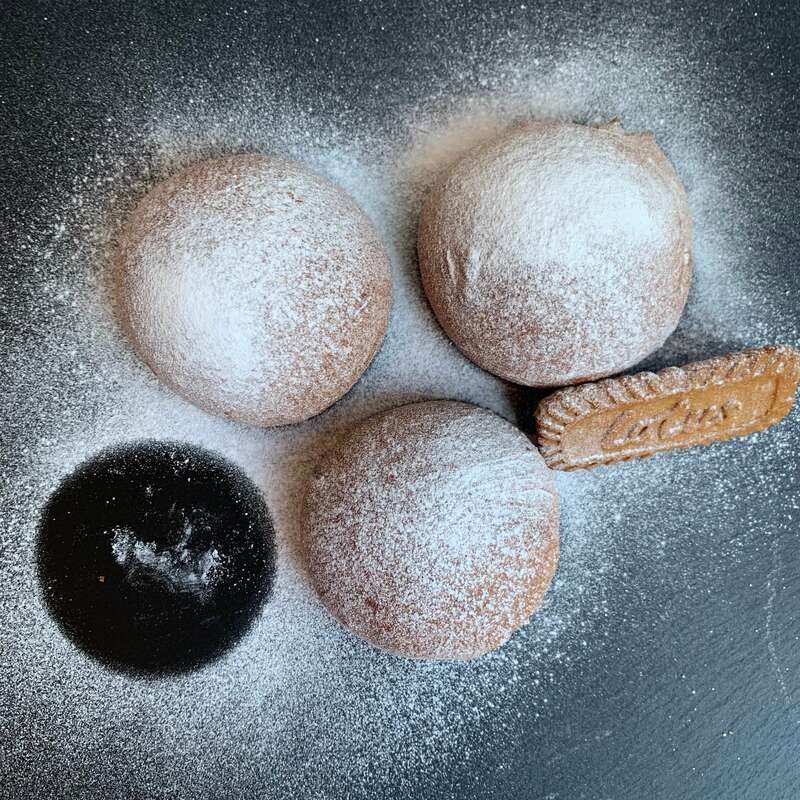 The dough coming out of the mixer is more like a batter than a dough but a night resting in the fridge, not only adds a depth of flavour but also firms up the dough so it can be shaped. For this attempt and to stop family arguments I went for a plain version, based on a Paul Hollywood recipe (but added a little more sugar). My wife was rooting for a choc chip and orange, I like a little lemon zest in mine. My youngest son Ethan, who is the bread connoisseur, likes it straight up when warm or with a little butter when it is cooled. If he has not snaffled the lot when it is warm that is. Bread can be a commitment but working it in around what you are up to is fine. I made the dough before I went to bed with every intention to bake it mid morning. 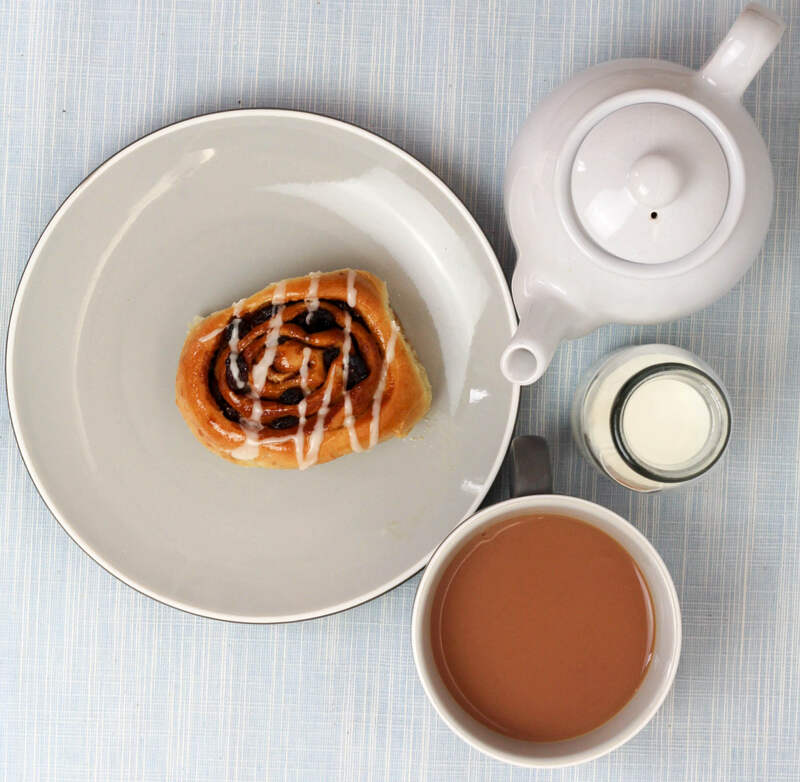 By the time I had gone out for a run with the eldest son, done some work up the allotment and walked the dog, it ended up an afternoon/teatime treat. The extra time in the fridge does it no harm. This heavily enriched bread with 5 eggs and lots of butter is deliciously rich but also amazing light. It is like eating a fluffy, buttery cloud. 1. Put the flour into the bowl of a mixer. Add the salt and sugar to the bowl and then the yeast, keeping it away from where you put the salt. 2. Warm the milk in a pan or in the microwave so it is tepid. Whisk the eggs into the milk and add to the dry ingredients. 3. With the dough hook attached, mix on a slow for 2 minutes, then speed up to a medium speed for 6 – 8 minutes until you have a soft, elastic dough. It will still be very wet. 4. Cut the butter into tablespoon size chunks and add to the dough and mix for another 5 minutes. Half way through, scrape down the sides of the bowl right down to the bottom, to ensure that the flour and butter is thoroughly mixed in. The dough will still be very soft. 5. 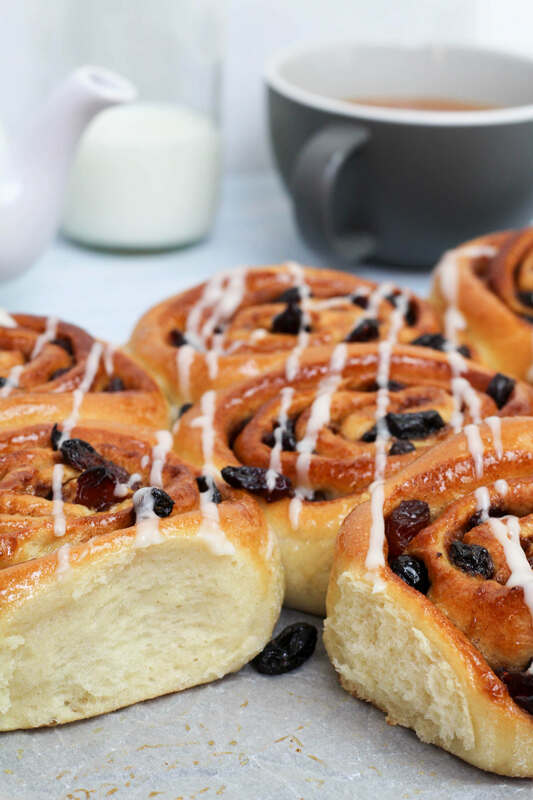 Tip the dough into a bowl, cover with clingfilm and put in the fridge overnight. The dough will firm up and you will be able to shape it. 3. Grease a 23cm-25cm round deep cake tin. A springform tin makes it easier to get out (I used a 23cm as that was the largest I had). 4. 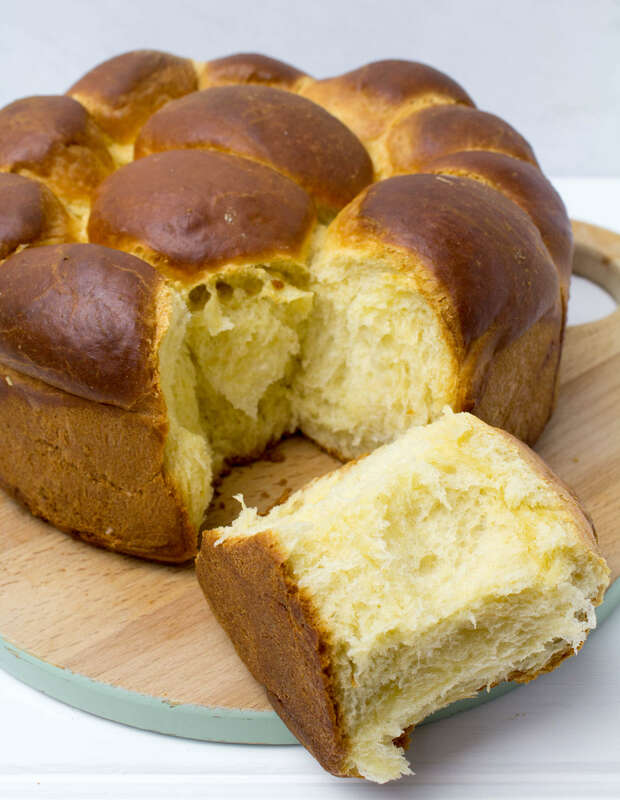 Take your brioche dough from the fridge. Tip it onto a floured surface and knock it back. Divide it into 12 equal pieces. Roll each piece into a ball. Put 10 of the balls around the edge of the tin and two in the middle. 5. 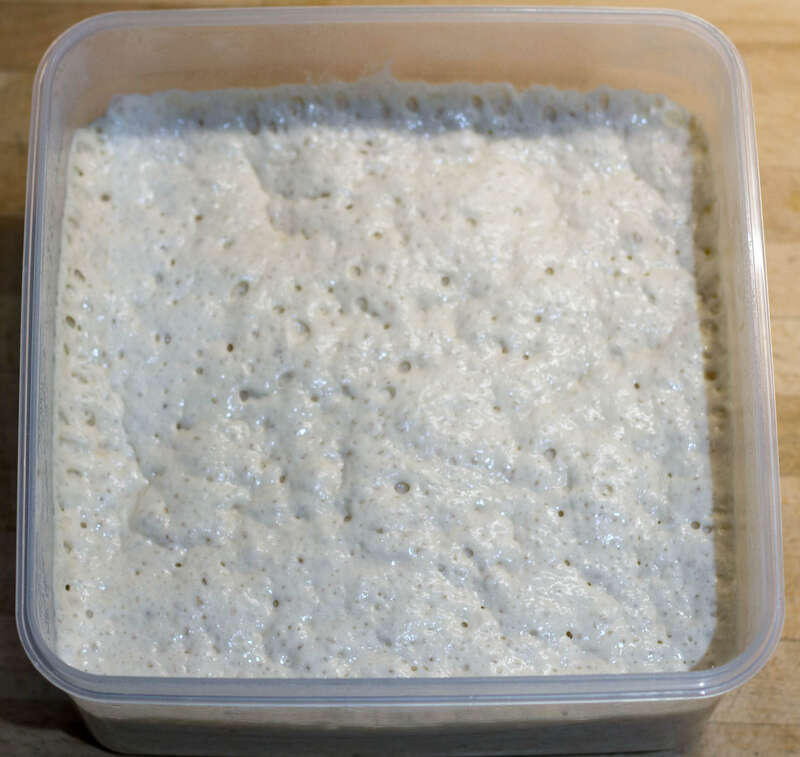 Cover with the clean plastic bag and leave to prove for 2 – 3 hours, or until the dough has doubled in size. 7. When doubled in size, bake for 25 – 30 minutes or until a skewer inserted into the middle comes out clean. If it is getting too brown place some foil loosely over the top. 8. Remove the brioche from the tin and cool on a wire rack. Back to a bit of bread baking this weekend. Bread has been my nemesis for most of my baking life, that is until this year when I had a eureka moment. I realised that I had always made my dough too dry and that produced bread with the same density of lead which would sink any duck we fed it to in the local park! This year my bread skills have improved greatly. My latest favorite bread being the “slipper”, the Italian retort to the French baguette. 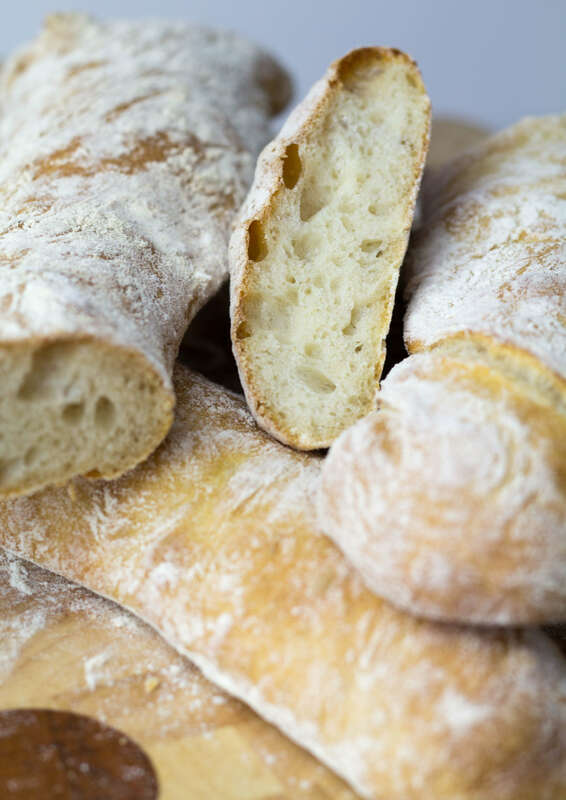 The fantastic ciabatta, a versatile light and open textured loaf. The dough is the polar opposite of the dense dry dough’s of old. The Ciabatta dough is very wet and loose. You really need a stand mixer to knead the dough to build up the gluten. Then you prove it in a square Tupperware box for a couple of hours before carefully transferring the dough to a heavily floured work surface. Cut into loaf shapes and quickly transfer them to baking sheets before the dough try’s to ooze off the workbench. 1. Oil a 2 litre square plastic container. 4. Add the olive oil and water and begin mixing on a slow speed. As the dough starts to come together, turn the speed up to medium and mix for a further 5-8 minutes until the dough is smooth and elastic. 5. Tip the dough into the oiled container, cover with some plastic wrap and leave until at least doubled in size – a couple of hours. 6. Preheat the oven to 220°C and flour 2 baking trays. 7. Generously dust the work surface heavily with flour. Gently tip out the dough (it will be very wet), trying to keep a rough square shape. Handle it gently so you do not knock much air out of the dough. Dust the top of the dough with more flour. 8. Cut the dough in half lengthwise and divide each half lengthwise again. Place on prepared baking trays. 9. 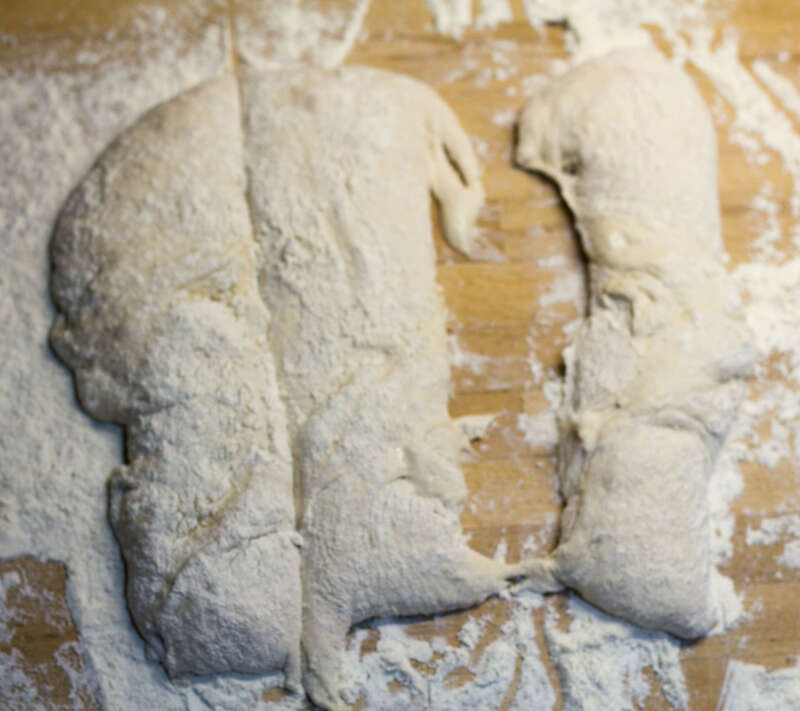 Leave the ciabatta dough to rest for 10 minutes, then bake for 25 minutes, until the loaves are golden brown and sound hollow when tapped underneath. Cool on a wire rack. My latest favorite bread being the "slipper", the Italian retort to the French baguette. 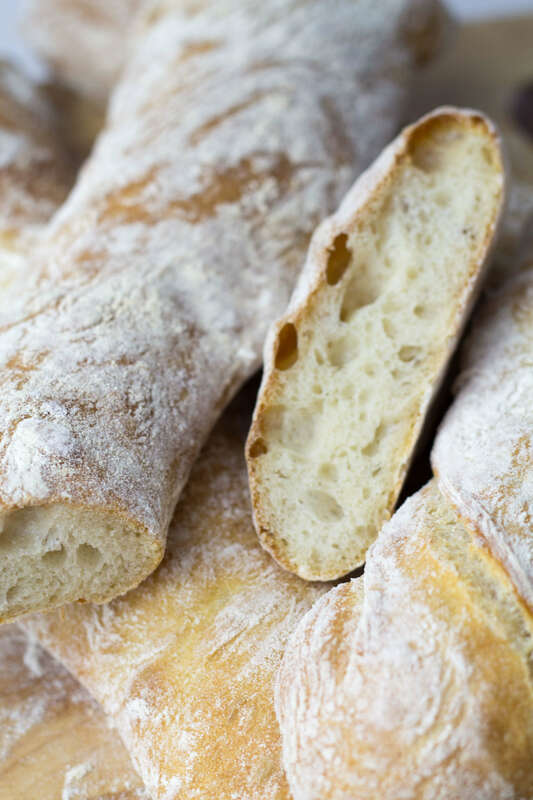 The fantastic ciabatta, a versatile light and open textured loaf. Oil a 2 litre square plastic container. Add the olive oil and water and begin mixing on a slow speed. As the dough starts to come together, turn the speed up to medium and mix for a further 5-8 minutes until the dough is smooth and elastic. Tip the dough into the oiled container, cover with some plastic wrap and leave until at least doubled in size – a couple of hours. Preheat the oven to 220 C (200 C fan) and flour 2 baking trays. Generously dust the work surface heavily with flour. Gently tip out the dough (it will be very wet), trying to keep a rough square shape. Handle it gently so you do not knock much air out of the dough. Dust the top of the dough with more flour. Cut the dough in half lengthwise and divide each half lengthwise again. Place on prepared baking trays. 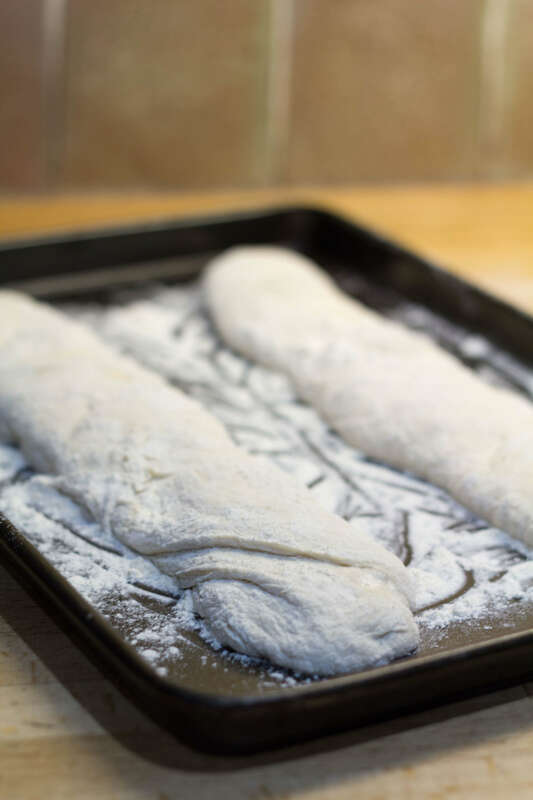 Leave the ciabatta dough to rest for 10 minutes, then bake for 25 minutes, until the loaves are golden brown and sound hollow when tapped underneath. Cool on a wire rack. During botanical week of the Great British Bake Off, the technical challenge was to bake a fougasse. Traditionally a leaf shaped bread, quite similar to an Italian focaccia. Tom Gilliford one of the contestants declared ‘I love fougasse. It’s actually my cinema snack !’. 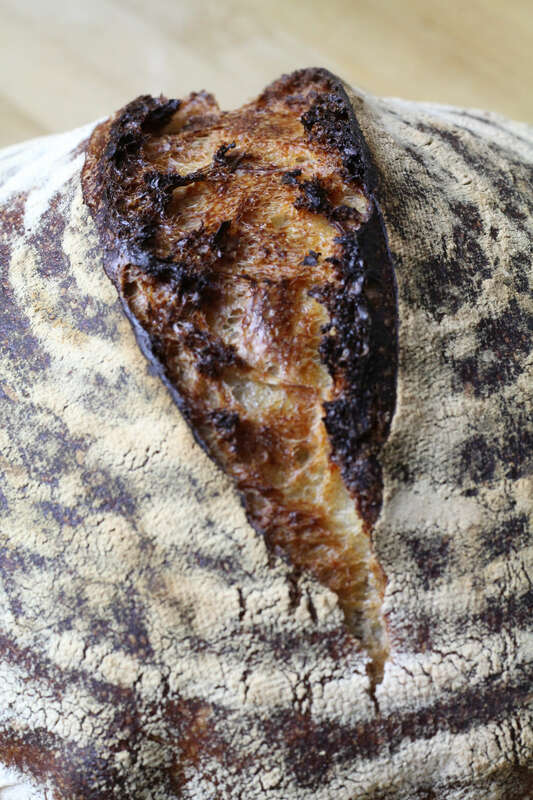 Which spawned a lot of amusement on Twitter and brought this little known bread into the public eye. Instagram and Pinterest have been flooded with everyone’s new favourite cinema snack. 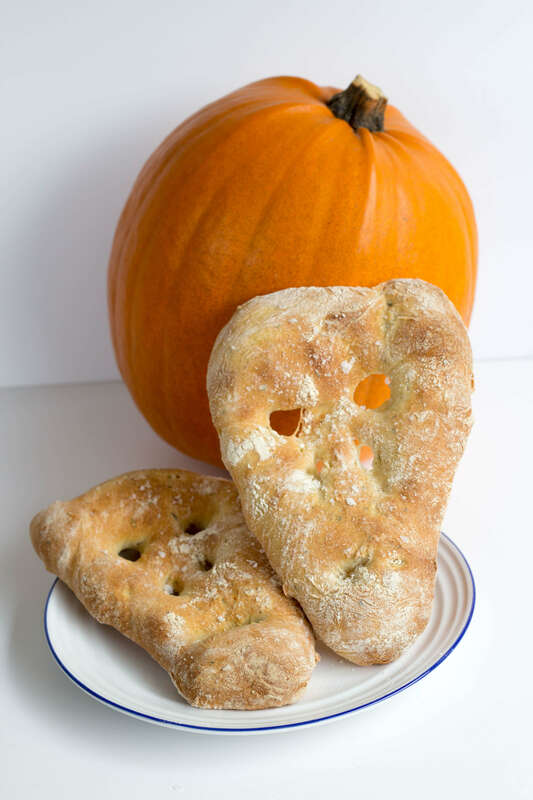 Staying on the Great British Bake Off theme, I also saw a previous contestant Richard Burr post a fougasse Halloween themed bread. So I thought it was time I gave it a go. Historically bread has been my nemesis but these came out a treat. As always I like to tweak recipes a little and added some dried mixed herbs and also used some good quality Maldon sea salt (I am from Essex after all!). 1.Put all the dry ingredients into the bowl of a mixer. Keep the salt and yeast on opposite sides so that the salt does not retard the yeast. 2.Add the oil and the water to the bowl. Mix with a spoon to bring together the ingredients. 4.Transfer the dough to an oiled bowl, cover with cling film and prove in a warm place for about a hour, until the dough has doubled in size. 5.Put plenty of flour onto the work surface and tip out the dough. I use a plastic dough scraper to make this easier. You want to keep as many bubbles in the dough as possible so treat it gently. Then sprinkle plenty of flour on the top. 6.Using a sharp knife, divide the dough into quarters. 7.Carefully lift each quarter onto the baking trays so there are two on each tray. 8.Cut eyes, a nose and a mouth into each piece of dough. This is tricky as the dough is quite wet. 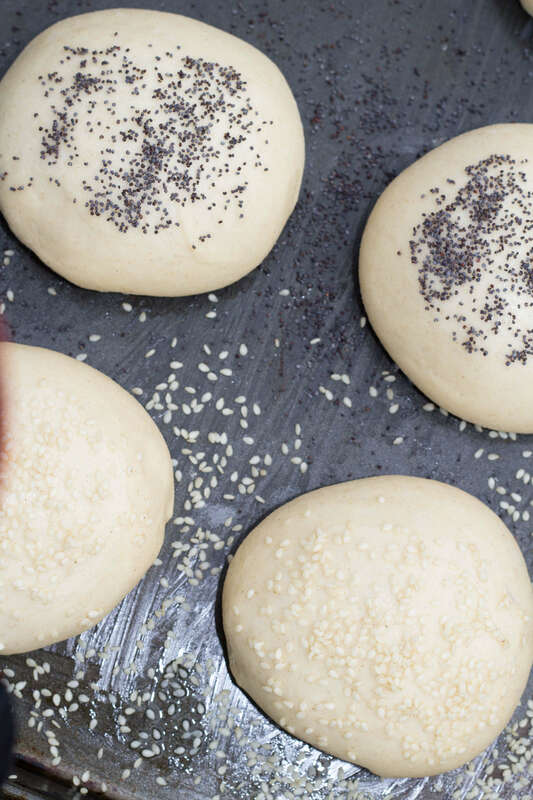 Open out these holes by gently pulling the dough into the shape you want. 9.Cover with oiled clingfilm and leave to rise for 20 minutes. 10.Preheat the oven to 220°C/fan 200°C. During botanical week of the Great British Bake Off, the technical challenge was to bake a fougasse. Traditionally a leaf shaped bread, quite similar to an Italian focaccia. Tom Gilliford one of the contestants declared ‘I love fougasse. It’s actually my cinema snack !’. Which spawned a lot of amusement on Twitter and brought this little known bread into the public eye. Instagram and Pinterest have been flooded with everyone's new favourite cinema snack. Put all the dry ingredients into the bowl of a mixer. Keep the salt and yeast on opposite sides so that the salt does not retard the yeast. Add the oil and the water to the bowl. Mix with a spoon to bring together the ingredients. Transfer the dough to an oiled bowl, cover with cling film and prove in a warm place for about a hour, until the dough has doubled in size. Put plenty of flour onto the work surface and tip out the dough. I use a plastic dough scraper to make this easier. You want to keep as many bubbles in the dough as possible so treat it gently. Then sprinkle plenty of flour on the top. Using a sharp knife, divide the dough into quarters. Carefully lift each quarter onto the baking trays so there are two on each tray. Cut eyes, a nose and a mouth into each piece of dough. This is tricky as the dough is quite wet. 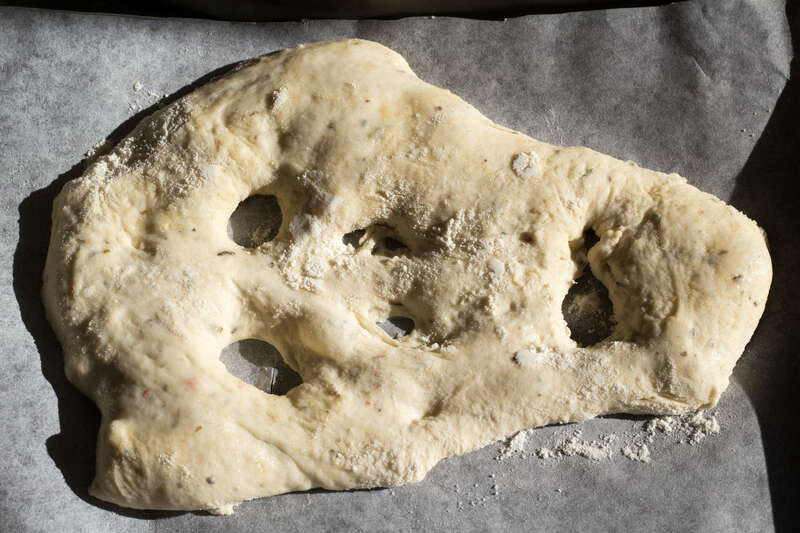 Open out these holes by gently pulling the dough into the shape you want. Cover with oiled clingfilm and leave to rise for 20 minutes. Preheat the oven to 220°C/fan 200°C. My good friend Jimmy Ginger tweeted me at the end of the week to see if I had any good soft burger bun recipes. My answer was let me have a play at the weekend and I will get back to you. Now Jamie aka “Jimmy Ginger” is a keen foodie, BBQ fanatic and more importantly a very good artisan chilli sauce maker. So I know the standard will need to be high. I have known Jamie all my life, even as kids we were foodies, a passion we inherited from our parents. We both ended up in the City working for financial institutions. However we let our creative sides run wild outside of our respective offices. Mine being generally focused on bakes, whereas Jamie’s is growing chilli peppers for his delicious artisan sauces but we both are passionate about BBQ. So after a few attempts I have landed on the below recipe which are soft and delicious. They are only proved once, which is a great time saver if you are getting ready for a big BBQ. 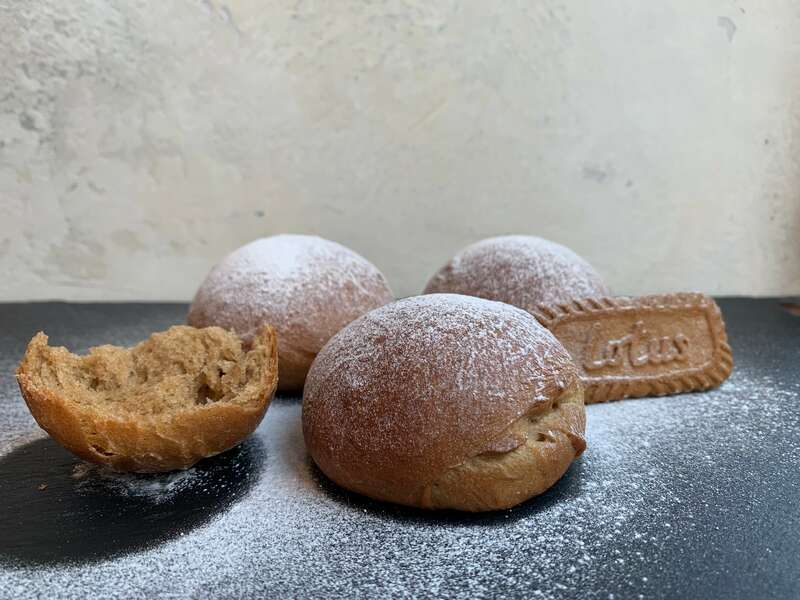 These rolls are also made with plain (all purpose flour) rather than strong bread flour and use milk and butter in the mix. That combination makes a rich, soft and buttery roll, perfect for a BBQ’d burger. Please pop along to Jimmy Gingers website to read his story and take a look at his store and chilli shop. 1. Sift flour into a large bowl or the bowl of a stand mixer with the dough hook attached. 2. Add the yeast and sugar to one side of the bowl. Add the salt to the other side of the bowl. This helps stop the yeast being retarded by the salt. 3. In a small pan warm up water, milk and butter to around 120F/50C. Ensure the butter has melted (so it is quite warm to the touch). This will help kick start the yeast. 4. Make a well in the centre and add in the egg and most of the the warmed liquid ingredients. Reserve a little which can be added through the next step. 5. Mix together well and bring to a ball. You dont want an over dry dough or it will not rise well. I prefer my dough on the slightly wetter side at this point as when you start kneading you can add a little flour to bring it to a smooth and silky consistency. 6. Knead for 10 minutes by hand or 7 minutes in a stand mixer with a dough hook. 8. Split the dough into 12 pieces and roll into balls. Slightly flatten the balls and place on a greased baking sheet, 6 to each sheet. Cover with oiled plastic wrap and leave to rise until doubled. About an hour in a warm room. 9. Preheat oven to 200C/180C Fan. 10. 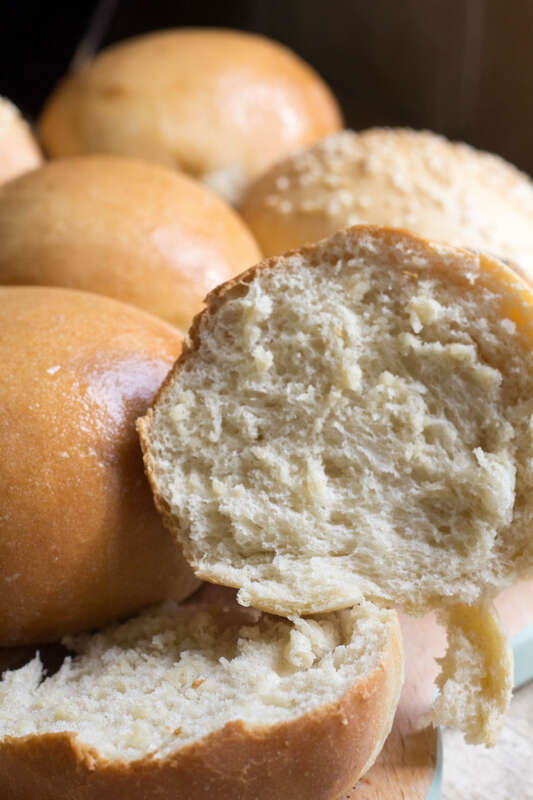 You can brush the risen rolls with a little milk and sprinkle with poppy/sesame seeds if using. 11. Bake for around 10-12 mins until golden brown . Once out of the oven I like to brush over a little melted butter to give them a shine. Cool on a wire rack. 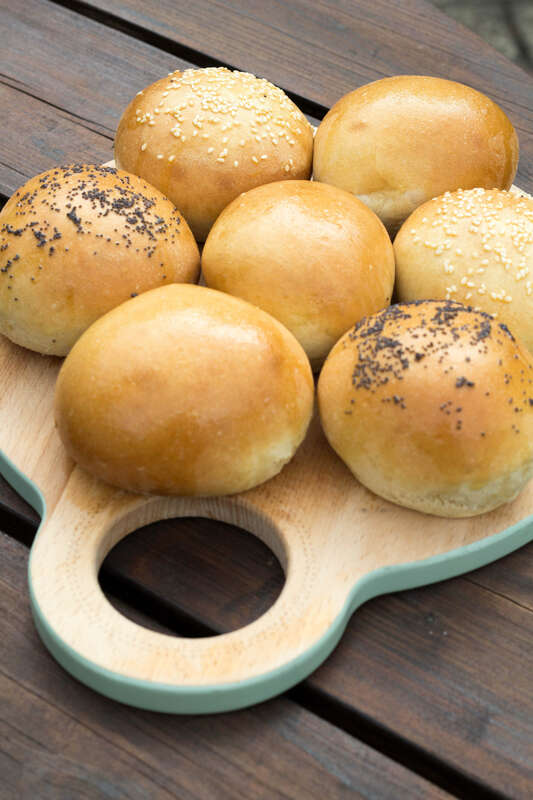 A rich, soft and buttery roll, perfect for a BBQ'd burger. Add the yeast and sugar to one side of the bowl. Add the salt to the other side of the bowl. This helps stop the yeast being retarded by the salt. In a small pan warm up water, milk and butter to around 120F/50C. Ensure the butter has melted (so it is quite warm to the touch). This will help kick start the yeast. Make a well in the centre and add in the egg and most of the the warmed liquid ingredients. Reserve a little which can be added through the next step. Mix together well and bring to a ball. You dont want an over dry dough or it will not rise well. 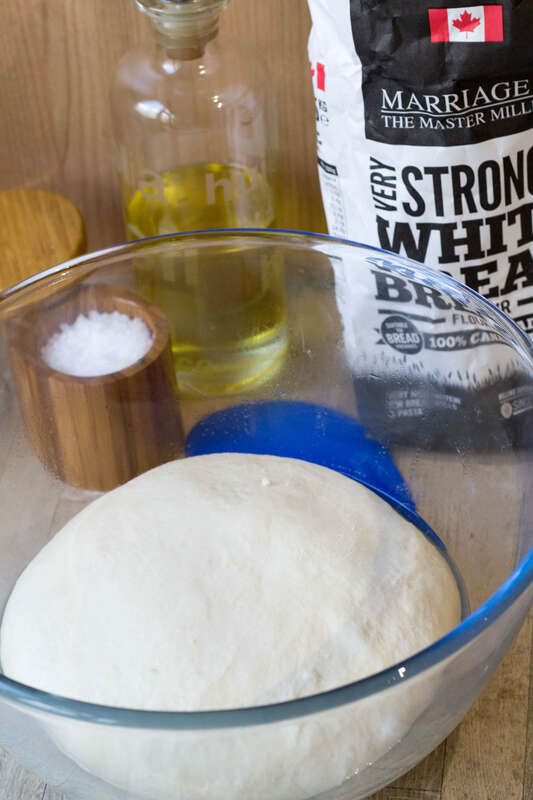 I prefer my dough on the slightly wetter side at this point as when you start kneading you can add a little flour to bring it to a smooth and silky consistency. Knead for 10 minutes by hand or 7 minutes in a stand mixer with a dough hook. Split the dough into 12 pieces and roll into balls. Slightly flatten the balls and place on a greased baking sheet, 6 to each sheet. Cover with oiled plastic wrap and leave to rise until doubled. About an hour in a warm room. 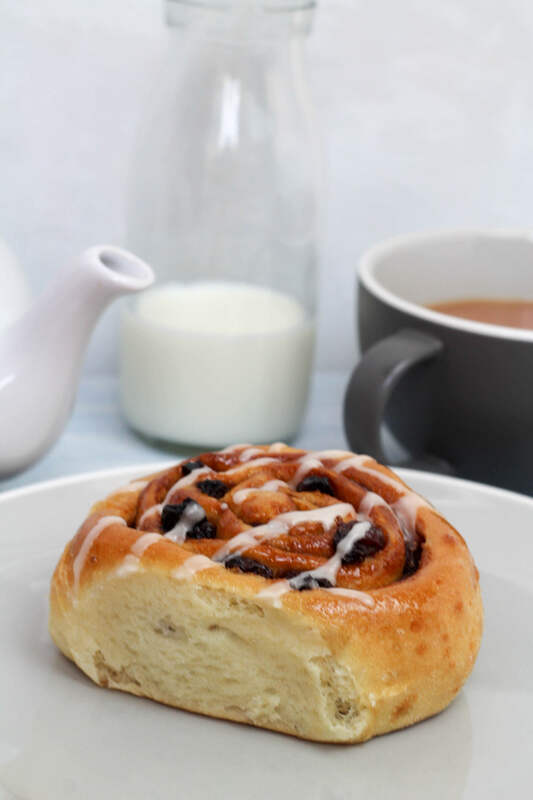 You can brush the risen rolls with a little milk and sprinkle with poppy/sesame seeds if using. Bake for around 10-12 mins until golden brown . Once out of the oven I like to brush over a little melted butter to give them a shine. Cool on a wire rack. Nothing beats the smell of a fresh loaf baking in the oven. 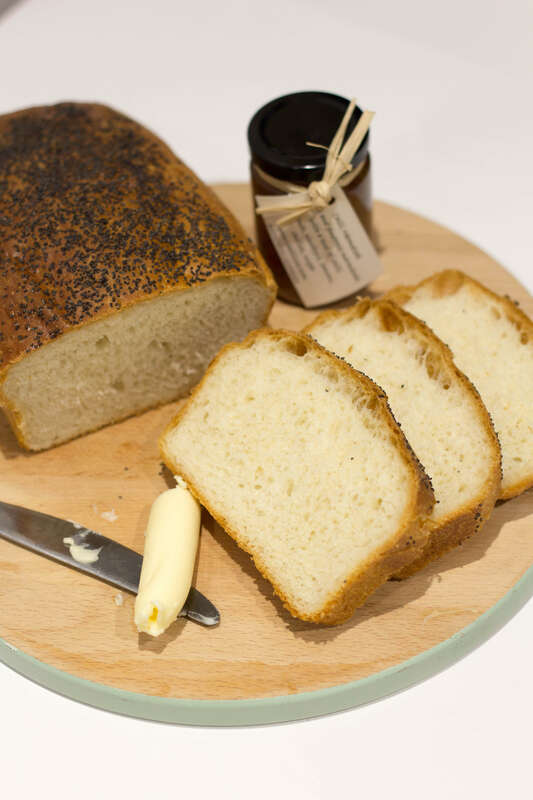 In my opinion you cannot beat a soft white loaf covered with poppy seeds, slathered in butter and jam or toasted as big doorsteps the day after making it. My first childhood memory of baking was with my dad. I was probably around 7-8 years old and he had decided to start bread making. As this was well before the internet, I to this day have no idea where he got the recipe from. I would guess by the outcome it was from the local brick maker! The loaf that came out of the tin had the same density of lead. We decided to offer it to the birds, even they struggled to break through the impenetrable crust. Our dawn chorus for weeks after was birds tweeting with lisps whilst their poor little beaks recovered! A good few years later I am glad to say we can now bake a lovely soft and light loaf. 1.Sift flour into a large bowl or the bowl of a stand mixer with the dough hook attached. 2.Add the yeast and sugar to one side of the bowl. Add the salt to the other side of the bowl. This helps stop the yeast being retarded by the salt. 3.Make a well in the centre and add in the water and cooled melted butter. 4.Mix together well and bring to a ball. You do not want an over dry dough or it will not rise well. I prefer my dough on the slightly wetter side at this point as when you start kneading you can add a little flour to bring it to a smooth and silky consistency. 5. Knead for 10 minutes by hand or 7 minutes in a stand mixer with a dough hook. 6. Once the dough is smooth and elastic, gather into a ball and put it in a lightly oiled bowl, cover the bowl with plastic wrap or a bag and leave it to rise in a warm spot until it has doubled in size. 7. Once doubled in size it is time to ‘knock it back’ Basically just punch all the air out of it and knead for 30 seconds. 8. 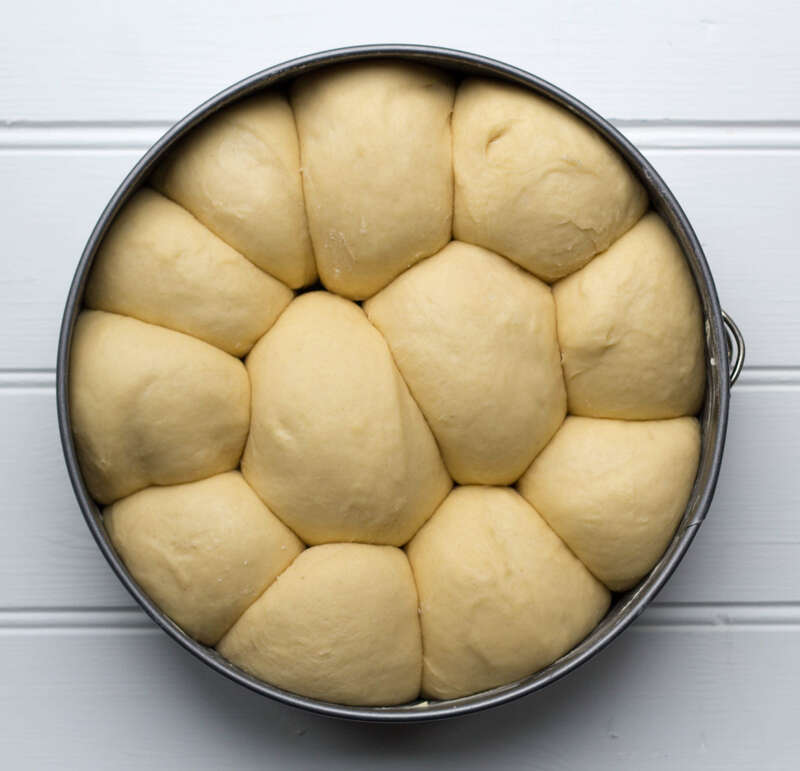 Shape the dough to fit your loaf tin. Cover with oiled plastic wrap and leave to rise until doubled again. 10. Carefully egg wash the top of the loaf and sprinkle with a little salt (or poppy seeds if using). Do not let the egg wash touch the tin as that will make removing it very hard. 11. Bake for around 30 mins until the loaf is golden brown and sounds hollow when tapped underneath. Cool on a wire rack. A small lovely soft and light loaf. Make a well in the centre and add in the water and cooled melted butter. Mix together well and bring to a ball. You do not want an over dry dough or it will not rise well. 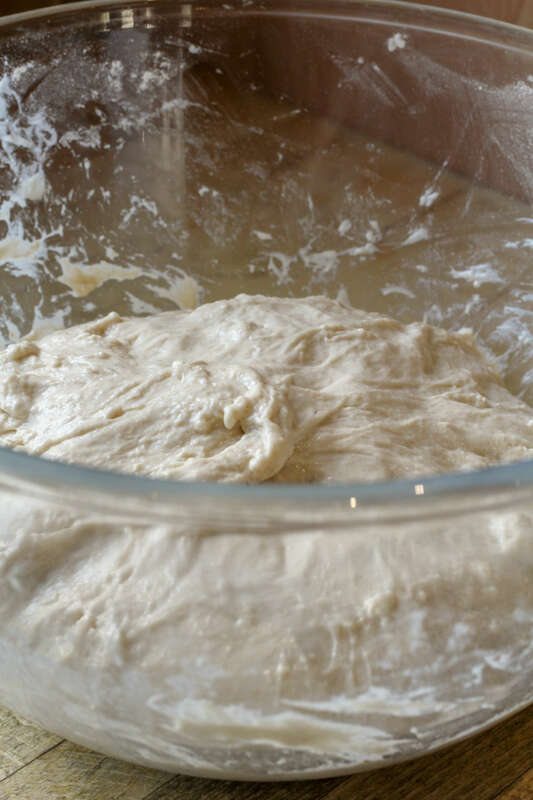 I prefer my dough on the slightly wetter side at this point as when you start kneading you can add a little flour to bring it to a smooth and silky consistency. 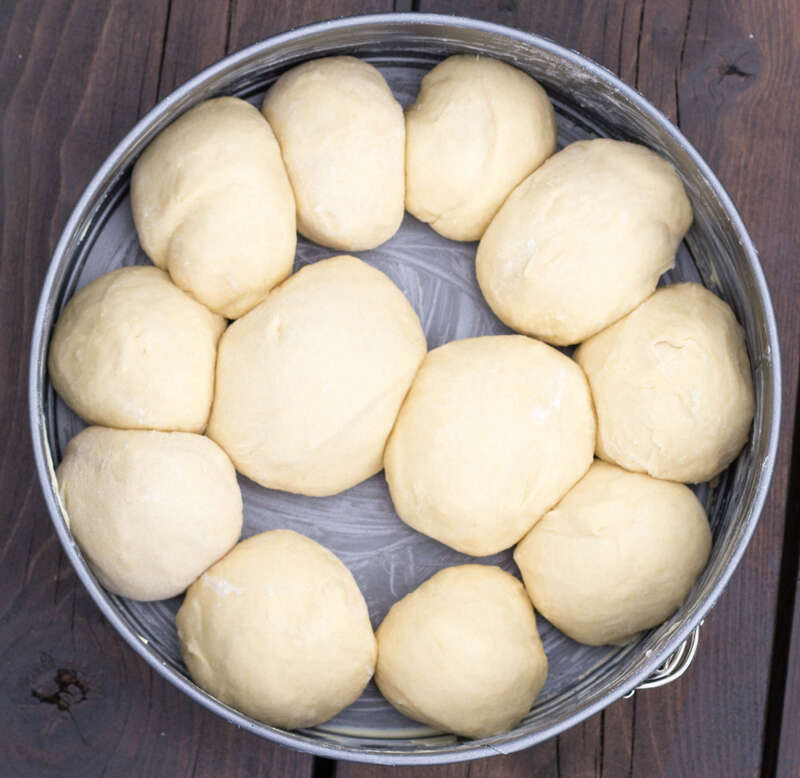 Once the dough is smooth and elastic, gather into a ball and put it in a lightly oiled bowl, cover the bowl with plastic wrap or a bag and leave it to rise in a warm spot until it has doubled in size. Once doubled in size it is time to 'knock it back' Basically just punch all the air out of it and knead for 30 seconds. 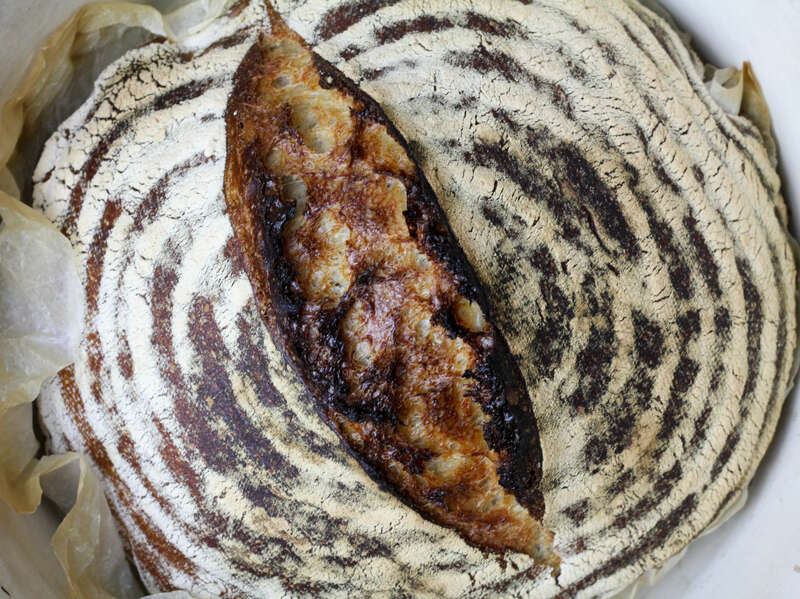 Shape the dough to fit your loaf tin. Cover with oiled plastic wrap and leave to rise until doubled again. Carefully egg wash the top of the loaf and sprinkle with a little salt (or poppy seeds if using). Do not let the egg wash touch the tin as that will make removing it very hard. Bake for around 30 mins until the loaf is golden brown and sounds hollow when tapped underneath. Cool on a wire rack. Recipe adapted from Leiths Baking Bible.